Herod III Antipater (born prior to 20BC; 4BC – 39 AD), known by the nickname Antipas, and was the son of Herod I the Great (c. 4 BC/1AD). Antipas was a 1st-century ruler of Galilee and Perea, who bore the title of tetrarch (“ruler of a quarter”) and is referred to as both “Herod the Tetrarch” and “King Herod” in the New Testament although he never held the title of king. He is widely known today for accounts in the New Testament of his role in events that led to the executions of John the Baptist and Jesus of Nazareth. After being recognized by Augustus upon the death of his father and subsequent ethnarch rule by his full brother, Herod II Archelaus, Antipas officially ruled Galilee and Perea as a client state of the Roman Empire. He was responsible for building projects at Sepphoris and Betharamphtha, and more important for the construction of his capital Tiberias on the western shore of the Sea of Galilee. Named in honor of his patron, Emperor Tiberius, the city later became a center of rabbinic learning. Antipas divorced his first wife Phasaelis, the daughter of King Aretas IV of Nabatea, in favor of Herodias, who had formerly been married to his half-brother Herod II. (Antipas was Herod the Great’s son by Malthace, while Herod II was his son by Mariamne II). According to the New Testament Gospels, it was John the Baptist’s condemnation of this arrangement that led Antipas to have him arrested and his wife to demand his head. She promised him an exotic dance by her daughter Salome, who would eventually become queen of Armenia Minor. John the Baptist was subsequently beheaded in Machaerus. Because of this divorce with the daughter of Aretas, war broke out on the border of Perea and Nabatea. The result of this war proved disastrous for Antipas. Roman counter-offensive was ordered by Tiberius but abandoned upon that emperor’s death in 37 AD. Consequently, in 39 AD Antipas was accused by his nephew Herod Agrippa I of conspiracy against the new Roman emperor Caligula, who sent him into exile in Gaul. Accompanied thereby Herodias, he died at an unknown date. The Gospel of Luke states that Jesus was first brought before Pontius Pilate for trial since Pilate was the governor of Roman Judea, which included Jerusalem where Jesus was arrested. Pilate initially handed him over to Antipas, in whose territory Jesus had been most active, but Antipas sent him back to Pilate’s court. Antipas was not Herod’s first choice of heir. 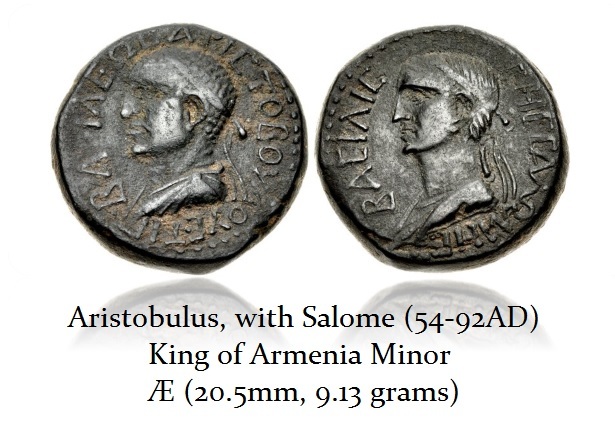 That honor fell to Aristobulus and Alexander, Herod’s sons by the Hasmonean princess Mariamne. It was only after they were executed (c. 7 BC), and Herod’s oldest son Antipater was convicted of trying to poison his father (5 BC), that the now the elderly Herod turned to his youngest son Antipas. During his illness in 4 BC, Herod had yet another change of heart about the succession and turned instead to Antipas’ elder brother Archelaus was now to become king of Judea, Idumea, and Samaria. Antipas would rule Galilee and Perea with the lesser title of tetrarch. Herod Philip was given Gaulanitis (the Golan Heights), Batanaea (southern Syria), Trachonitis and Auranitis (Hauran). 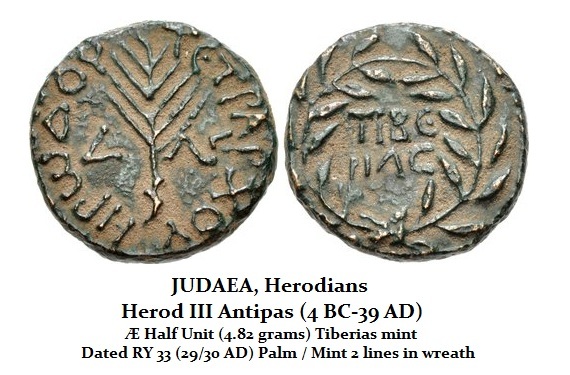 The coinage of Herod Antipas is all rare. They are often found in poor condition because of a combination of inferior alloy and the weather conditions in the north are significantly different from the south. The denomination name is not known.